I am an Electronics engineer and I was searching for some good free engineering eBooks. I came across this fantastic website where we can legally download all kind of engineering eBooks for absolutely free! These eBooks are written by highly respected professors from top universities in the world. This website actually offers free eBooks for all kind of students. These eBooks are sorted by different educational fields. The engineering eBooks are sorted in three sections. These three sections are Chemistry and Chemical Engineering, Civil Engineering, Electrical and Electronics Engineering. All the Engineering eBooks are actually very informative. I found some good eBooks which provide basic knowledge of important subjects. Basic knowledge is very essential to understand concepts and learn some more complicated things. Legally Free Engineering eBooks – How This Works? Bookboon offers free engineering eBooks with the good use of advertisements. They set 15% advertising limit per book to ensure and maintain the quality of free eBooks. This limit is decided after discussing with professors, business professionals, and student organizations. This idea made it possible to provide legally free eBooks to the students around the world. 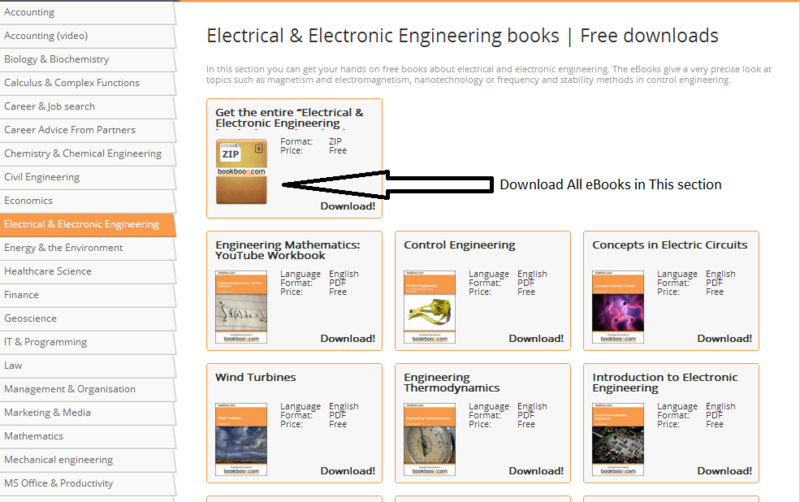 How to Download Free Engineering eBooks? Below are the links to download legally free Engineering eBooks. You can download all the eBooks present in each of these sections with the single ZIP download as shown in the image or else download only selected eBooks in PDF format. Registration is not required. You just need to sign up for newsletter. Download as much eBooks as you want from Bookboon. There are no any restrictions. Advertisements are not evil! This world runs on money and the easy way to give something for free is the advertisements. It’s not a big deal, if you are getting valuable knowledge for free.